Michael Dowdle’s bio is the musical equivalent of the resume of a CEO. He has played rock, jazz, classical, country, and everything in-between. On my mission, we were only allowed to listen to hymns or the Tabernacle Choir. His album 50 Favorite Hymns was a lifesaver. Adding to his vast musical repertoire, Michael is releasing a new rock/fusion album called Convergence. 1. (of several people or things) Come together from different directions so as eventually to meet. 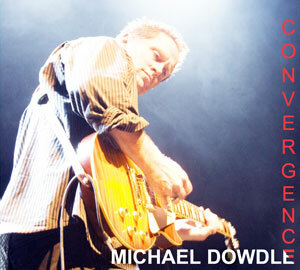 His album represents the Convergence of thirty-one years of experience into 49 minutes of pure guitar pleasure. This isn’t a record filled with mindless runs and flashy guitar licks. Each track has its own unique sound and yet all are brilliantly cohesive and melodic tunes. Don’t get me wrong. There is plenty of lightning-fast playing to satisfy your inner shredder, but all is woven into the fabric of some very tasteful compositions.